Table 1. Description of the study sample. Table 2. Bivariate analysis by mortality in the first week. Table 3. Bivariate analysis by administration of anticoagulant treatment. Table 4. Bivariate analysis by administration of antiplatelet treatment. 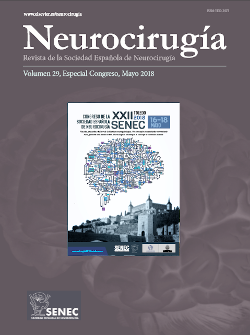 Study of hospital cohorts of the 243 patients who attended with pure TBI to the emergency service of the Arnau de Vilanova University Hospital in Lleida between June 1, 2015 and June 1, 2016. Sociodemographic, clinical and other variables related to clinical management were collected. Presence of complications and in-hospital mortality were registered at 24h, at 48h and one week after TBI. Overall, 50.2% of patients were men, with median age of 80.8years, and without CT-scan findings at admission in 62.3% of cases. A total of 14 patients died (5.8%). Overall mortality was associated with comorbidity, with knowledge loss and with fluctuation of the Glasgow comma scale in the acute process. Patients treated with anticoagulants (39.5%) or antiplatelet agents (33.3%) were older, with higher degree of dependency and more comorbidity, but did not present more complications. Without reaching statistical significance, higher mortality was observed during the first week in anticoagulated patients (7.3% vs. 4.8%, p=0.585) or with antiplatelet treatment (8.6% vs. 4.3%, p=0.241) with respect to those not treated.